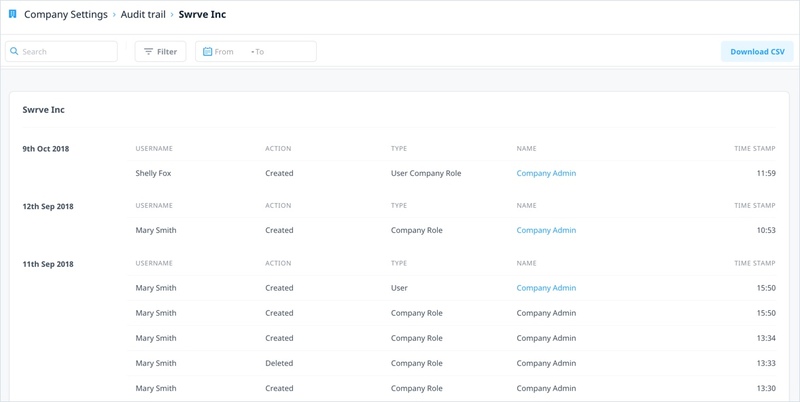 Swrve’s new audit trail feature provides a comprehensive record of user actions performed within campaigns. It streamlines all relevant activity into a single repository giving you a searchable and exportable activity log straight from the dashboard. The new audit trail feature captures a range of data for the key entities: campaigns and users—including administrator activities such as user and role-level actions. This feature provides the intelligence for admin and audit investigators to find and view users’ actions within campaigns. Name: the name given to the entity, for example the user role or permissions. To set up the retention period for your records select Settings. Audit trail records are retained for 30 days by default—records that are more than 30 days old are automatically removed from the audit trail on a daily basis. 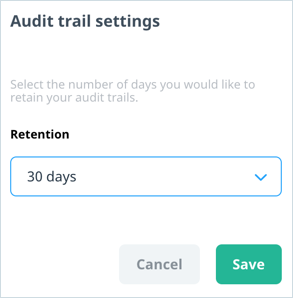 If you wish to retain records longer than 30 days, reset the retention period using the Settings option on the Audit Trail screen and select a new duration from the Retention drop-down list. Select Save to confirm the new setting. 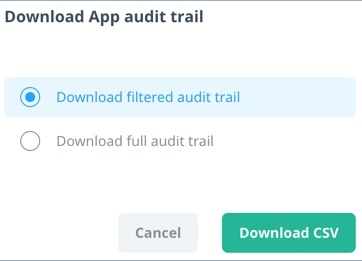 Search for a particular audit trail: type the name of an audit trail you want to view. Filter the results by Action: Created, Updated, Deleted, Duplicated, Archived, Stopped, and Launched. Filter the results by Type: Enter the type of notification selected for your campaign. Filter the results by Username: Select a particular user from the Select User drop-down list. Select a specific date range: Select the relevant dates in the From and To calendars. Use the arrows on each of the calendars to change the month and year. Select Download CSV from the main audit logging screen to download all company or app audit records. When reviewing user activities from the View All screen, Download CSV provides the option to download all records or a filtered set of records. Select Download CSV to confirm the selected option and perform the download. The Swrve Audit Trail feature ensures that you can set up and maintain regular audit logs for traceability and security control.